Beautiful Incentives: Melissa & Doug Terrific Twenty List and Giveaway! Welcome to the Terrific Twenty, where i'm sure you will not leave before finding something so unique and perfect for your little one/s! The holidays are coming fast, the stores are filled with the smell of holiday scents, the decorations inspire and you see toys everywhere, but have NO idea what to choose! Well, have no fear, The Terrific Twenty is here! This list will guide you in your internet shopping mission! Take a look at all the great picks they have carefully selected as the best of the best for 2012! This year, I took advantage of this opportunity so that I could donate an absolutely adorable toy to a child who doesn't normally get those kinds of gifts. Who rarely if at all ever gets gifts. I will also be holding a giveaway for another child whose parents are fortunate enough to get on a computer to try and win! 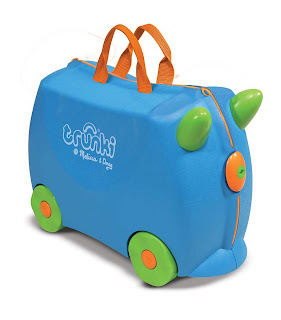 I chose this adorable and very functional Trunki! Kids can stash their belongings inside and ride around to their favorite place to play with them. They can even use it to travel with you. Just throw their favorite toys in there and go! It makes them organized AND gives them exercise! Hopefully less for you! Hurry and click on over to Melissa & Doug's Facebook page, "like" the page and enter to win one of the Terrific Twenty! This was a sponsored post and I was given two products in exchange for my review. One for myself and one for a giveaway. I am not responsible for mailing out the giveaway, the sponsor is.